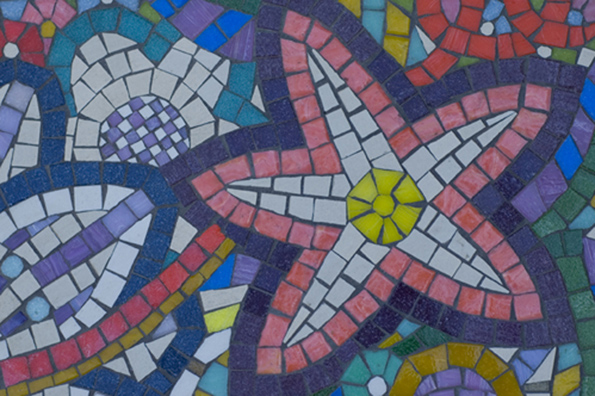 Jo Thorpe has become a name synonymous with mosaic. But Thorpe is making the age-old tradition of mosaic trendy again. With an eye for colour and composition, she delicately constructs mosaic for wall hangings, table tops, bathrooms and outdoor spaces. The only other mosaicist she mentions is Space Invader – an anonymous Parisian artist who pastes coloured tiles on walls to form cartoon-like mosaic. Enthused by the idea of the art-form being implemented as street art, Thorpe has considered filling the cracks in pavements with beautiful mosaic tiles, but wonders what implications this will have as Hackney Council does not currently recognise the concept of street art. Thorpe completed a Fine Art degree at Wimbledon School of Art (now Wimbledon College of Art) before setting up a studio through SPACE on Martello Street – sharing her workspace with a photographer and producing plaster sculptures. She was living in Brixton at the time and on her way home one evening, as she was walking past the Gypsy Caravans, she got bitten on the bottom by an Alsatian. “Hackney was really rough back then,” she explains, “and that was the last straw. I had to get all the way back to Brixton and I was really upset – I’d had enough of the to-ing and fro-ing so I decided never to go back to that studio.” She began waitressing. Earlier this year, after a joyful 15 year stint in Brixton, Thorpe decided to move to East London. “Most of my friends lived out east and I spent a lot of my time going out in the area so I decided to move here”. Leaving her well-established home and studio and chucking out a life-times hoarding worth of black sacks, she moved to Clapton and settled into the ground floor flat she now shares with her partner. Thorpe enrolled on a mosaic course at City Lit and, keen to launch her career, forged herself as an established mosaic artist to her landlady who was a director at Mosaic Workshop. Her first job was to make a walk in shower cubicle out of Cararra, a white Italian marble, for Sophie Anderton who was living with Robert Hanson, son of Lord Hanson, just off Marble Arch. Thorpe recollects the muscles in her hands aching beyond belief as she slogged on to prove her capability. She now charges anything between £700 and £1000 per square metre of bathroom tiling. She is now, of course, inundated with commissions. Currently working on the swimming pool of Boddington Manor, she has been commissioned to adorn metre upon metre of step and stone paving with her vibrant mosaic. At her house I witnessed the intricate laying of different coloured ceramic and glass tiles as she placed them onto a brown paper template taken from the area around the swimming pool. She affixes the tiles face down with PVA glue so that when the piece is complete, she can take it to Boddington Manor, lay it face down, splash with water to loosen the glue and voila! A mosaic transfer is laid. Magic. Other projects have included the restoration of Aston Villa’s gold lettering outside the stadium – an extravagant project with each tiny handmade gold-leaf tile costing £1 (she used 5000). Also an elaborate restoration venture at the National Portrait Gallery where Thorpe used brewed tea to colour-match the ancient marble with the new tiles – ensuring a perfect match. Importing glass mosaic from all around the world can result in frustrating batch variation – ranging from subtle shade differences to the extreme – where the tiles are almost another colour entirely. Mexico has proven prime culprit for sending over boxes of tiles that could almost be perceived as two different colours. In the future, Thorpe would like to work more from nature and flowers whilst securing orders for her button-mosaic vintage coffee tables. But with a growing list of commissions, including a bathroom moonscape and a tarot-readers favourite ‘high-priestess’ card embossed on her floor, it might be a while before she can return to creating art for art’s sake. Having been exposed to a wide-ranging clientele, Thorpe exposes men as being less inclined to become creatively involved in the design – tending to leave her to her own devices. Women, however, love to discuss colours and shapes.